Filed to: go Zora!Filed to: go Zora! Artist Nelde has created these designs for a deck of Legend of Zelda playing cards. Pretty neat, yes? 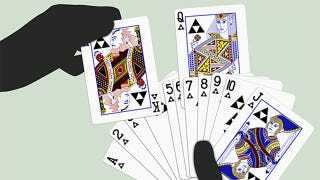 Not only do the Zelda images fit the traditional playing card style, but he's even drawn some intricate new details: the ace of Triforce is a nice touch. You can see the images in greater detail in Nelde's gallery below.